Aertherials never ask "Why Fly?" They are their flight, albeit imaginary flights of introspective insights and an artistic philosophy of life that lend naturally to their arriving at perceptual heights undreamt. Most as fledglings have learned the value of an unduantable sense of try and try again, whatever expend in achieving psychic ascent, that sometimes, even by their own demanding standards of success, themselves surprise. This in a land of Big Sky, Big Pie, Big Size, to which the Aertherials say "Never Die!" a land demanding greater "Can-Do-It-iveness" and a most unusual openness to new ideas and perspectives of the world. Yes, Aertherials can and do fly, with great scope and precision. Aertherialism is derived from a barely conscious miasma struggling to voice a new beingness of which any artistic movement may be said to originate. It is new doctrine if not dogma (new doggerel, perhaps to skeptics?) of intracranial as much as interstellar flight. Aertherialism is a new aesthetic, a new-fangled artistic idealism, a tangible promise in its altitudinal attitude and aerial artifacts. As new as it is, it is just as much evidence of a very ancient urge in the human breast, Aertherialism the latest dream of flight, reborn in each generation in new forms and new expressions. Aertherists would claim it is an impulse to gravitate towards and join the oft-intuited and as often intimated realm of the spiritual, to which it is the latest heir. Aertherialism reflects the need to unite with the holy heavenward, the mythical beyond mortality’s keen, the final abode of the vaporous soul, which is nonetheless the essence, the vital force, to which the cessation of breath is the cessation of living, though seemingly inevitable, to the Aertherial is not final. Rather, it is to be resurrected into a new atmosphere where works of art are air, the artist recognized aeronaut in the issues of his/her artistry as a kind of immortality. Aertheriality exists despite lack of wings, in the appreciation of what wings can do. Aertherials create metaphorical wings and become one with the universal ether by which all is ultimately determined and defined. Paradoxically, Aertherials never leave the ground, but just as well are always in the air. They accomplish this feat of levitation by sheer will, a capacity to transfer what they believe to what they imagine aerial elevation to be, at least in so far as their minds can graphically illustrate. Thus, the Aertherial is a balloon in a child’s hand, a bird in a tree, a cloud on a mountain, an aeroplane above a skyscape, a planet in orbital revolution, a spacecraft to the stars, an angel in the everafter, a new thought, idea, suspension of disbelief in a new way, even a new credulous incredulity, all clement speculations on states, variously euphoric, of the Aertherial dimension. Eternal, an Aertherial, an angelic being in whose heart burns Hope’s Eternal Flame. Aertherial: 1. Someone who asks “Why not fly?”, 2. Something of a heavenly or positive and airy nature, 3. Someone who believes in vicaricanism or that discourages mooglahism. The Aertherials: 1. People who believe in uplifting (heavenly, light, airy) creativity. The Aertherial Movement is a very small but growing group of poets and creative artists who go by the name of the Aertherials, because they believe in the common goal of uplifting with their creativity, or else using the creativity to reach a more enlightened state. The movement was encapsulated by a declaration of the definitions of Aertheriality (a variation on ethereal with more specific and implied meanings) that has been posted online at the top of this page. “Aertherial” could be said to be a portmanteau of the words “art,” “air,” and “ethereal.” The original author has gone by the simple pen name of “An Aertherial” for the piece. The definition was completed in May of 2003. 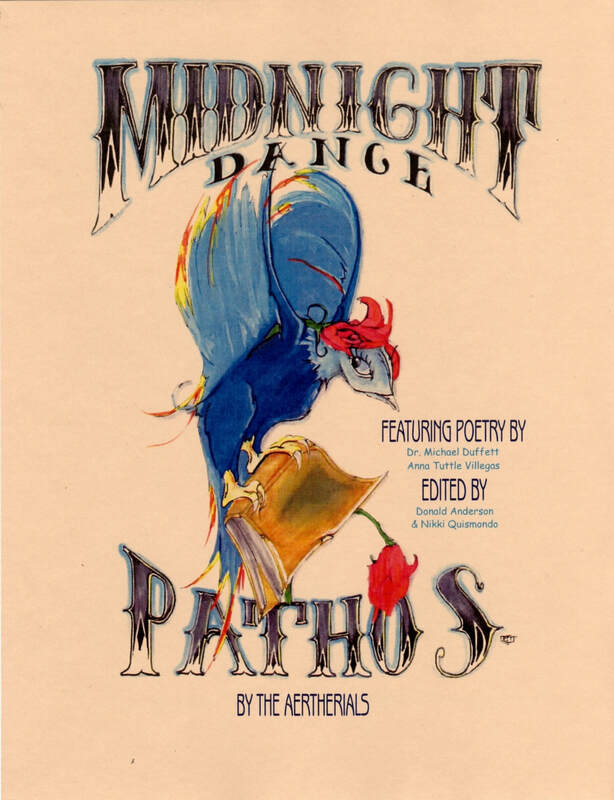 There have also been (at least) two known comb-bound anthologies (no longer in print) off of a small self published press that have used the name “The Aertherials” as a group name for the authorship, which were Naked Poetry (2003) and Midnight Dance / Pathos (2004). mooglahism: 1. The belief that disposable, consumable goods should be sold for maximum profit, 2any behaviour that disregards future consequences in favor of temporary gratification. vicaricanism: 1. The belief that anything is possible, to question all the beliefs which deny compassion, and that one should do all one can to make the best possible scenario become a reality, 2belief in one's ability to, in the things one does and conceptualizes, change the world and everything in it. What are the relatively recent projects? What is Poet’s Espresso (or Poet's Espresso Review)? Poet’s Espresso/Poet's Espresso Review is a San Joaquin Delta College Writers’ Guild partnered newsletter or zine of poetry! Poet’s Espresso was founded in June 2005 by Donald R. Anderson, shortly after joined by Nikki Quismondo (Anderson) as co-editor and co-publishers equal. She took on most of the eye for aesthetics and he took on most of the computer use to get it the way she described. The newsletter initially served the local writers and artists in the Stockton, California area. Local area poets wanted to share their creative works with the public. Poet’s Espresso gave them that opportunity and began formulating a zine of 4 to 8 doublesided sheets folded in half and stapled, with local creative artists work in it. The newsletter came out ever two months and gets circulated to Stockton’s local venues (coffee shops, colleges, restaurants, book stores...) including Lodi CA., Modesto CA., San Francisco CA., and Emeryville, CA. and Sacramento CA. Since 2010 it has has new editors and become quarterly as Poet's Espresso Review, the longer name. Patricia Mayorga is the current editor. How much does it cost? For those who would like to subscribe, contact Patricia Mayorga on the contact us page. “...I've become even more fascinated by the strange world of zines and zine makers. It's a world inhabited by the wildest assortment of unusual characters and unique stories. What do reviewers think of Poet’s Espresso? Poet's Espresso (Sept.2008): This poetry zine also reads like a newsletter for poets in San Joaquin Delta College, which is what the editor acknowledges in his letter to readers. The poetry varies widely in subject but is consistently good, and my favorite was "Should Be Doing" by Allen Field Wietzel. The zine also includes recipes, art, and local poetry-related announcements. Patricia Mayorga, poetsespressoreview@gmail.com, www.poetsespressoreview.com -katie, review in Zine World #27. Poet’s Espresso is a great read! The pages are filled with poetry, art, and photography work. So if you love the arts, read Poet’s Espresso. Poet’s Espresso is also entertaining, with some fun fabulous facts, inspirational quotes, recipes and comic strips. Look at the bio pages! See the poets, get to know them, read their biographies and contact them if you would like to know more about their work. Not knowing what to do in California? Poet’s Espresso also offered a Calendar of Events section many from the list online at www.rainflowers.org, just in case you would like to know where to go for Open Poetry Mic readings, Book signing events, musicals, art galleries, theatrical plays, and more! By all means, send us an email, call us, send it through post mail. We need recipes, comic strips, poetry 50 lines per page or less including stanza breaks, prose, and photography and artwork, email us them in .jpg, .gif, .png, .tif, or bitmap forms only (or by exception an occasional .pdf or .eps) at PoetsEspressoReview@gmail.com, or mail a copy to Patricia Mayorga, with a Self Addressed Stamped Envelope if you wish your hard copies returned, same methods for photography work which we also encourage... there are many great landscapes and creative innovations in California. Most importantly we will need your Contact Information! Include with your submissions your name, number, address, a 2 to 4 line bio of yourself written in third person (from he/she point of view). A photograph of yourself is optional for the bio section. Once we receive your work, we will send it under review to see if it is appropriate for the theme. If your work is chosen, we will send out an email, call you or send you a letter in the mail. Let us know which is preferred. Who Submits To Poet’s Espresso? Here’s a list of the contributors of poetry and their work titles up to present. What is Artifact or Artifact Nouveau? Currently in its second year of publication, Artifact Nouveau is a re-branding of Artifact (2007-2014). Artifact Nouveau is a magazine of works by students, faculty, alumni, and employees of San Joaquin Delta College published by the SJDC Writers’ Guild. Works by writers and artists unaffiliated with Delta College are also accepted, but at least 60% of featured artists are from our community. We accept submissions year round, publishing Fall, Spring, and Summer issues. All genres and mediums are welcome. Submit to artifactsjdc@gmail.com. View issues of Artifact Nouveau at issuu.com/thewritersguildartifactnouveau and our website at deltacollege.edu/org/wrtrsgld/pubinfo.htm. We need your Contact Information! Include with your submissions your name, number, address, a 2 to 4 line bio of yourself written in third person (from he/she point of view). A photograph of yourself is optional for the bio section. What is A Name Unwritten by Roger E. Naylor? From George Washington to Abraham Lincoln, the Spirit of 1776 is examined in the Light of Biblical Analysis based on the "clues" offered by the historical events, themselves, as in the "coincidence" of 1812 with the Alphabetic Ascription=AHAB, which terrified the 18th Centurions...The thesis, if you will, is simple--The Emperor is wearing the same Old Clothes, New Rome, as the Founders consciously moldeled the American Republic, falls into the same pitfalls and has the faults inescapably visited on Ancient Rome that lead to its own demise...It is a question of Providential Destiny as such! What is Darwin’s Children, Comb-bound Anthology of Poetry and Art, published September 2002? Darwin’s Children was a collaboration of five coeditors: Stephen M. Wilson, Kristen N. Wiles, Roger E. Naylor, Marie J. Ross, and Donald R. Anderson, six other poets, one cover artist Keith Marston, and some public domain illustrations. The five co-editors and some of the poets invested their money into printing up 200 copies of the book through S.J.D.C. who at the time was generously allowing publication through their print shop to Delta students. They even printed extra copies of the book! The book project was worked on countless hours and sessions at Manny’s on Pacific Avenue and at The Caffeine Den, after which the poets deemed themselves “The Caffeine DeniZens,” also due to the fact that that was where they had all met at the Open Mic nights hosted by Joe Brundidge and had taken in Donald’s offer to set them up with printing at Delta similar to the poetry class at Delta’s semesterly publication. The effort involved a lot of joined decision making, a group intro poem, chapter titles, the book title (by first a brainstorming of any possible title in all that we could think of, then a voting elimination process by the coeditors,) an organization to the order of these chapters into a storyline/chronology of life, a back review by each coeditor attributed to a dead poet’s name, working on pasting together public domain illustrations that came from copies of old library books onto a paper version of hard copy after the poems had been printed out, and creative biographies. The poets had an option to decide on the color(s) of the cover card stock of the books which they paid for. Greg was very accommodating and we very much appreciate all the help he had in this past project. The books were sold by word of mouth and at The Caffeine Den and Harding Way Newsstand on consignment. In 2004 Donald R. Anderson and Nikki Quismondo teamed up to coedit and co-publish the anthology of poetry and art, Midnight Dance / Pathos, including over 54 contributing creative artists, in comb-bound form locally, printing them up and binding them by hand and stamping them with numbers when they could afford to print up more. The book only got up to the 69th copy before it fell apart due to lack of understanding and compromise between its contributors, as well as due to lack of funds to continue to print up more copies. However, this was a learning step that taught not only some valuable business lessons to the partnership, but also some insight into what could be improved in the search for becoming an actual publishing business at some future point. In 2007 Donald and Nikki published a new anthology, Sun Shadow Mountain, with a few years of more experience and thought put into making publishing actually succeed. Sun Shadow Mountain is an anthology (paperback book) of poetry, art, and photography! It is for sale now on Barnes and Noble online, Amazon.com, and lulu.com. A list of the online sellers is at This Link. At http://lodinews.com/articles/2007/09/29/lodi_living/arts/2_qna_anderson_070929.txt Lodi News Sentinel had done an article on Sun Shadow Mountain on Saturday, September 29th, 2007. Photo below by Angelina Gervasi from the article. Events! Thanks to all the support! We had a big turnout at Barnes, and all chairs filled plus some standing in Borders, and many came to Java Aroma, Valley Brew, we had a reasonable turnout at the Sacramento Poetry Center, and we had at least 50 at the Cesar Chavez Poetry Fest! We also had a creative combination with Ernie Johnson's play: (Click to view Flier for Nov. 11, 2007 Valley Brew Event!) and then a big turnout for poetry with painting displays at Margaret Troke Library, Stockton 6:30pm to 7:30pm, January 14, 2008. All the events were free entertainment to the community! Chief Copy Inspector, Project Coordinator, Font and Detail Specialist, Website designer. Poetry Editor, Copy Editor, Chief Art and Style Director. — Donald R. Anderson, founder and webmaster of Rainflowers.org.